Faith can mean different things to different people. It depends on your believes and what is going on in your life at the time you’re thinking about it. 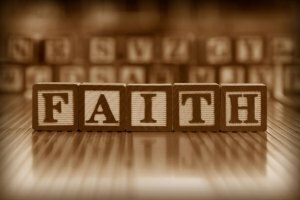 To me faith is when you believe in God. You know that he will guide you through any situation you may be in at the time and you trust in him. Faith is trusting in God to see you through anything. When you have faith, you’ll know that all is well. Here is an acronym that I heard a while back in church. To me it’s perfect and couldn’t have been said better. What do you think about this and how does it make you feel when you think about faith?